Who doesn't enjoy gaping at the fashion on the red carpet? After watching every award show, I look forward to the next day when I click through all the pictures I can find from the event. But unfortunately, while I try to keep a little glam in my life, there is no red carpet in my near future. So why do I so spend too much time researching the evening gowns, glittering jewels, teeny clutches and high heels? To dream! To be prepared just in case my next red carpet moment arrives! And to find hints of trends to come that I can adapt to my lifestyle. Celebrities and their stylists are ahead of the trend curve, like psychic fashion tellers. So I take cues from them to see what exciting direction fashion is headed and, if I like it, how I can incorporate it into my wardrobe. So what's the prediction from the 2012 Emmy Awards? The "greige" dress Brook Burke Charvet wore from Tony Ward Couture hints at the variations of white to wear after Labor Day. 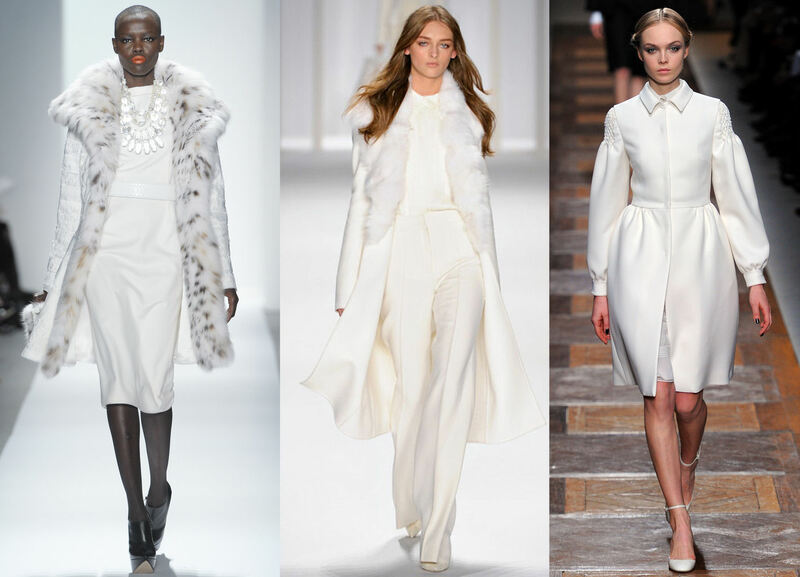 Yes, it's OK to wear white after the end of summer. In fact, wear it from top to bottom and don't be afraid to pair it with black shoes. Brooke's mermaid-cut, tulle evening gown is embroidered with Swarovski crystals. The curved lines of Macramé enhance her hourglass shape, similar to the body-conscious dresses made revered by Stella McCartney. The combination of black & white is always chic and classic and here, Jessica Pare is too. I adore this entire look, from her white Jason Wu dress and black accessories to her short, dark hair and red lips. 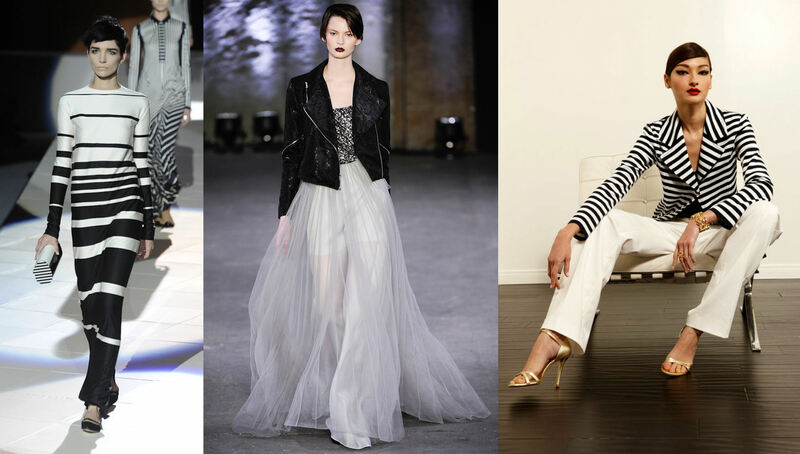 Lately, B&W has graced several runways. Lucky for you, your wardrobe probably already includes pieces to create this combo. Instead of the basic white top and black bottom pairing, try all white with black accessories like Jessica or black & white stripes, which appeared in many spring collections. 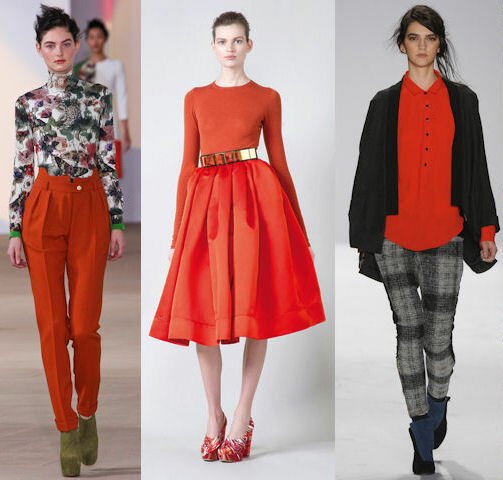 Orange, from burnt orange to bright orange to red-orange, is one of The Colors of the season! Padma Lakshmi and Ginnifer Goodwin both glow in Monique Lhuillier numbers. The normally neglected color that's hot for fall is easy to wear because it looks great with jeans and brown leather, plus it warms most skintones. Julie Bowen and Julianne Moore, who were absolutely radiant at the Emmy Awards, introduces the other color of the season - chartreuse. Julie is wearing Monique Lhuillier and Julianne is in Christian Dior. 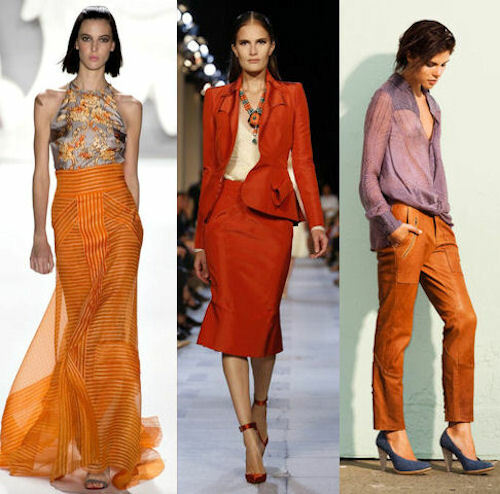 This color is a little trickier then the all-flattering orange. 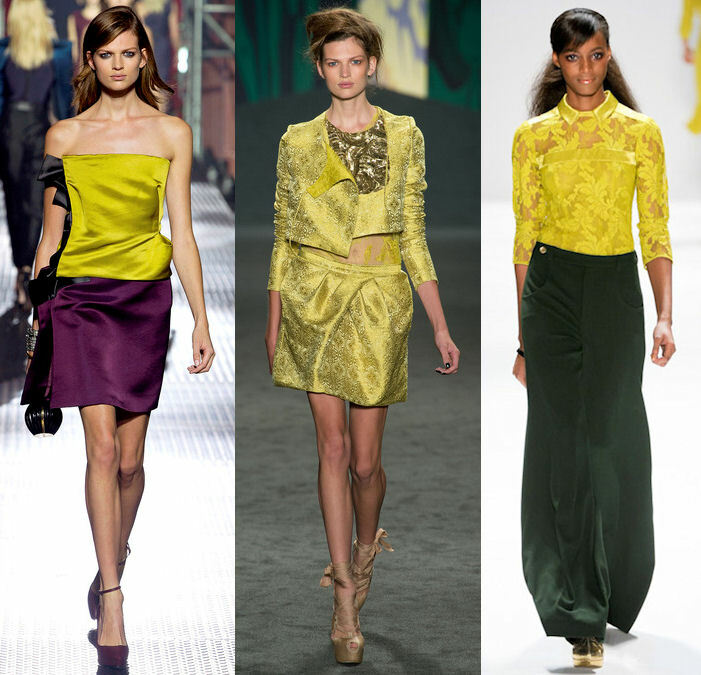 If it makes you look off, try a hue that's more yellow or green, brighter or duller. With the right chartreuse for your coloring, as you can see above, it can look brilliant. I'd also like to note Julianne's full circle skirt, which, long or short, is still the dress silhouette of the latest trends. Now that we have fall's "It" colors, what about spring? Say "Hello" to yellow! Hannah Simone in Emilio Pucci and Kelli Garner in Rafael Cennamo both chose yellow dresses for the Emmy Awards, as did many designers for their spring 2013 collections. Like orange, yellow can be fabulous, but the trick is finding the right shade for your coloring. When in doubt, ask a friend or trusted salesperson. 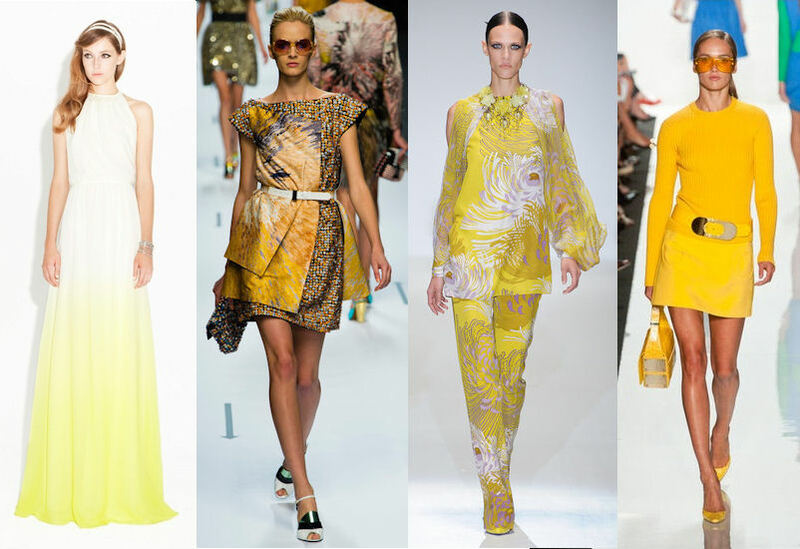 You can also try patterns with yellow or yellow accessories, like patent leather pumps or a satchel bag. 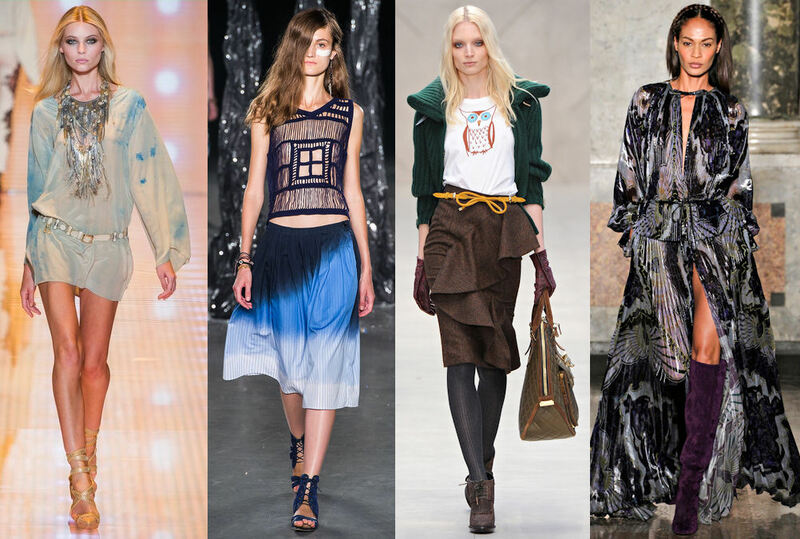 Boho is a type of style, and even lifestyle, that effortlessly outlasts the ever-changing trends. It may wax and wane, but there will always be girls with natural, wavy hair; long, flowy skirts, macramé and turquoise jewelry. At the Emmy Awards, that girl was Leslie Mann in Naeem Khan. This fall, look for distressed skinny jeans to tuck into tall brown suede boots, a (faux) fur vest and exotic patterns. Turquoise, aqua, seafoam, whatever you call it - I LOVE this color. My mantle is still decorated in shades of teal. I know, time for fall colors, but it's just so pretty. This widely beloved color is perfect for spring and will finally be available in a variety of options as the weather warms. Wear it with neutrals or other pastels. At the Emmys, Heidi Klum wore an aqua Alexandre Vauthier dress and Julianne Hough was in Georges Hobeika Couture. Tina Fey, Emilia Clarke and Shannon Woodward brought the high drama of Baroque to the Emmys in Vivienne Westwood, Chanel and Gabriela Cadena, respectively. According to Fashionising.com, one of my favorite fashion resources, Baroque garments mirror the "lavishness of artworks, architecture and plush interior decorations" and are characterized by gilded filagree, embroidery, plush appliques, velvet, leather, heavy brocades and gold. The website's editors suggest wearing Baroque fashion in one of two ways, like a royal or a rock star, and be cautious of the quality of cheaper versions. Look for more information about this lavish trend in a future post.